Felix Solis avantis, Spanish leader in quality wine production, continues becoming prizes thanks to the quality of their wines. The group has 6 wineries in the appellations of Valdepenas, La Mancha, Rueda, Toro, Rioja and Ribera del Duero and has been awarded with 14 gold medals and 2 silver medals in the German competition Berliner Wein Trophy. Berliner Wein Trophy is the first competition under the sponsorship of the International Wine Organization and the support of the Senate of Germany and the EU. In very few years, the competition has become more and more relevant, and nowadays it is one of the greatest in Germany and worldwide with more than 3,500 wines from all over the world. Every year, the competition awards the quality of wines in February and August in order to taste all the vintages which are available. Viña Albali Gran Selección 2014; Los Molinos Gran Reserva 2009; Casa Albali Red 2014 and Viña San Juan Rosado 2014 by Felix Solis. Castillo de Albali Reserva 2011; Arnegui Reserva 2011; Castillo de Albai Reserva 2010; Arnegui Reserva 2010; Condado de Oriza Reserva 2009; Altos de Tamaron Reserva 2009; Condado de Oriza Crianza 2011; Finca la Meda Alta Expresión 2011; Gran Bajoz 2011; and Pulpo 2014 by Pagos del Rey. Silver medals for: Viña Albali Rosado 2014 and Caliza Rosado 2014 by Felix Solis. It is especially remarkable the results for Pulpo and Casa Albali red, two new brands in the market, awarded with gold medals. 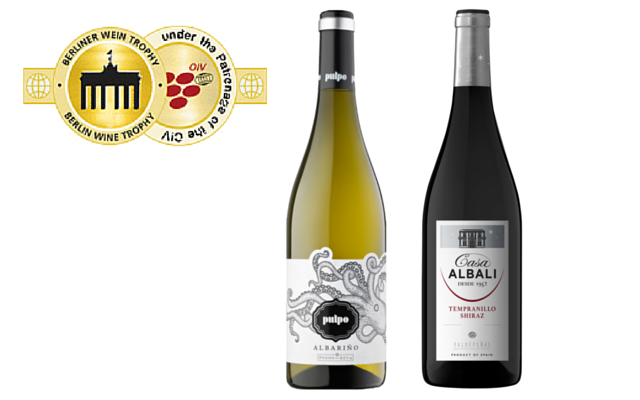 Both Pulpo, made of albarino from DO Rias Baixas and Casa Albali red, made of tempranillo and syrah from DO Valdepenas have also been presented in the recent international fairs and are widely distributed in the on- trade in Spain. Both have modern tastes according to modern styles.